Stay in the game, it’s not time to fold. February 10- Kuya Rolan Francisco. Miss your company, and I only wish for your happiness and success! Sana malakas ang business this time of year! Good luck! February 11- Roy Lagman My Cousin - Someday, I hope to celebrate with you your birthday. February 14- Bey Cunanan My classmate from University years. We've lost touch! Hope all is well with you! Goodluck! February 15- Dante Alim who I used to work with! Manong kumusta kayo'n? Sapay kuma ta adu pay nga grasya iti umay kenyayo ken iti pamilya yo! February 17- Marivic Hartman - Sister! Wishing you happiness lagi. and Hopefully we all get to stay fit and never get fat again. hehehe! Happy Birthday! February 18- Helen Gose - Goodluck sa iyo. Sana PR Na tayo soon! 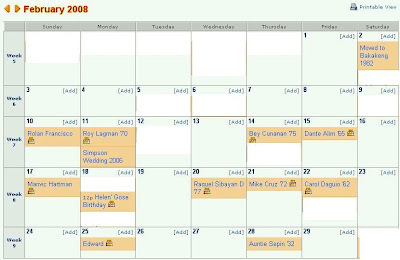 February 20- Raquel Sibayan Dacanay - Haaay naku I miss your company too! Cheers to you and being a mom! Happy Birthday! February 21- Mike Cruz, Keep the music Playing! Good Luck, Happy Birthday and Shalom! February 22- Ate Carol Daguio, Hope your birthday was a blast! February 25- Edward Ojastro - Goodluck on your Business this year!